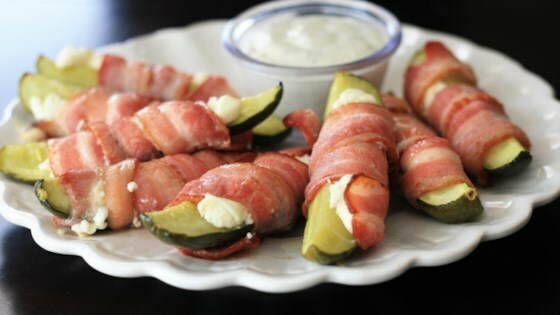 "You can pretty much wrap anything in bacon, including pickles! These are perfect for game day or any time of year. Thick-cut bacon doesn't work as well for these, so use the thinner slices. Serve with ranch or blue cheese dressing. These are also tasty dipped in Buffalo sauce." Pat pickles dry with a paper towel. Cut cream cheese into 8 strips. Place 1 strip onto each pickle, and wrap with a strip of bacon, securing ends with toothpicks if necessary. Place pickles on the baking sheet. Bake in the preheated oven until bacon is browned, 12 to 15 minutes. Let cool slightly, then serve with ranch dressing. Made it tonight, just as written. Was very good, will make again. Following the recipe the bacon was not cooked enough for my tastes. Next time I will pre-cook the bacon a little in a skillet (or microwave) so that it gets done properly. Delicious!! Best thing to ever happen to bacon ?? I added a little Cajun seasoning to the ranch dipping sauce to spice it up. Yeah, this was really good. In fact we're planning on making more this weekend. It's an odd combo for sure (and quite salty), but really tasty. Super simple to make. Delicious, savory, but a little messy. Husband and the kids loved them.